As a homeschool mom of 5 young children, teaching each child at their own level with their own subjects was slowly killing me. Like a slow moving poison, I was losing the life and passion and fire in my homeschool. I was burning out, I was frustrated, I was tired, something had to give. Language Arts, the one subject I was the most confident to teach my children, turned out to be the hardest subject to approach. Every angle I tried was met with tears–failure. Every curriculum I bought felt like a battleground–failure. Every time I asked my kids to write out an answer or read a book with me, they complained–failure. The love I had of the written word was not being passed down, I didn’t know where I had gone wrong. That was before Brave Writer, before I sat down with the Writer’s Jungle and worked out that my vision and my path were not lining up. It didn’t take me long to find that I had been pressuring my kids to read, to write, to spell, expecting them to know how to do it, without showing them a model of quality written works to emulate! Once I discovered this, I knew that I wanted to make a change, and the benefit of combining language arts into one time slot was just an added benefit! This post is part of a 5 part series. I will be sharing how we use poetry to teach language arts, how we use dictation to teach language arts, how we use free writing to teach language arts, and how we create our own writing projects. This will show you what the Brave Writer lifestyle is to us. I will also discuss a little bit about Brave Writer and how it works at the end PLUS an exclusive offer, so stay tuned! Copywork has been used for centuries as a way to teach our kids literary concepts by asking them to emulate some of the great works. When I think of copywork I think less about an educational tool and more about a form of punishment. Copywork has also long been used as a way to write lines to help children reflect upon their behavior (a tool I have used in my house a few times as well). So when I began to learn about the other side of copywork I had a hard time getting past the feeling of monotony and drudgery that I have associated with this task. The first step to incorporating this education model in my home was to change my mindset–and that had to start with me. So before I ever gave my kids a passage to copy I began doing it myself. I copied scripture, poems and quotes that meant something to me. I began to create a collection journal of things that spoke to me, things I wanted to remember. I found freedom and relaxation in the very process of copying it out. I found that the words, and the meaning behind them, was set a little more resolutely in my mind. I remembered what I was reading, and at the end of the day, I was creating a journal that meant something to me. This is the craziest part of my story, I didn’t have to get my kids to do this! My children saw me brewing a hot cup of tea and sitting by a sunny window. They saw me pulling out my poetry book or Bible and slowly working on my hand lettering while I copied the words on the book. They didn’t need to be cajoled or convinced, it was being modeled to them. It looked calming and relaxing and fun and they wanted in! I am firmly convinced that this is one of the greatest keys to homeschooling our children. We have almost all grown up with the model of a teacher and student. Something incredible happens when that picture shifts and you begin to take on more of a mentorship role. When you learn WITH your child, when you get right in there with them and show them they are naturally inspired to want to do it themselves! 1. Choose quality passages to copy. You are looking for passages that introduce a concept you are trying to teach. If your child is still in the early reading stage, find passages that re-enforce phonics rules that you are currently learning. If you want to focus more on grammar, choose a passage that has a new punctuation rule in it. Be specific in what you choose. Make it great, make it quality, make it count! Figure out what your child can do before they start to run out of steam or get emotional, then choose half that amount. You want to go for an amount that seems very attainable to your child, but then expect greatness from them. Ie. my grade 2 gets VERY emotional if he is too overwhelmed, so I give him 1 sentence, but expect him to do it to the best of his ability. You are targeting passages that you can use to build on your child’s grammar and spelling skills, this means that you need to discuss them. Before your child even begins to copy the passage, discuss the dialogue or the spelling rules, etc. For those of you with large families, you might be wondering what this looks like in a homeschool day. For me, it means bringing all five of my kids to the table, where they choose what they want to copy. What I loved most about copywork was that it was meaningful to me, it wasn’t rote work or busywork, it was enjoyable. I wanted to offer my kids the same experience so I let them choose what they want to copy. Maybe it is something in the book they are reading, or in the poem we did that week, often it is scripture or they will choose a non-fiction book about something they are doing in their nature journal. The choice is theirs. I choose not to dictate it because my vision, my long-term goal is to facilitate a love of writing, the technique will come. My 3-year-old draws lines and beginning letters in her notebook. She tries to form her letters one after another. My 5-year-old will often choose one of her readers, writing a line or a sentence. My 7-year-old always chooses one of his non-fiction books about bugs or animals or something that he is interested in. My older two usually choose quotes from their read alouds. It is different every time. Because they choose their own copywork, I don’t have as much control over the passages they are choosing, but it is developmentally appropriate so we make sure to have lots of discussion about their passage. I love asking why they chose that passage, I love giving my kids a highlighter or pencil and asking them to mark up their book with things they like the sound or meaning of. The discussion is my favorite part of the experience. We do copywork at least twice a week, though some weeks we do it every day as a part of our routine. Before I finish my ode to copywork, I wanted to share where my inspiration came from. I have been using Brave Writer as my primary language arts curriculum for nearly 2 years now and it changed everything you guys. You can read more about my journey here. The Writer’s Jungle is more of a manual for parents. It goes over the different writing stages and the Brave Writer lifestyle and how to teach your kids. The bundles are acutally walking you through it. They give you read alouds, copywork passages, dictation passages, and writing projects so that you have a plan of how to implement this style of teaching. I do not use the bundles, but rather have implemented the lifestyle. I recommend getting a bundle if you are new to Brave Writer as it shows you what it should look like. However, if you have been doing it for a year, take the leap! Doing it on your own gives you so much flexibility to tweak it and make it work for your family! I totally get that this is overwhelming, if you need a personal suggestion of where to start, I don’t mind setting aside some time to help you make this choice. Just email me and let me know your kids’ ages and grade levels and I can give you some suggestions that I think will work for your family. 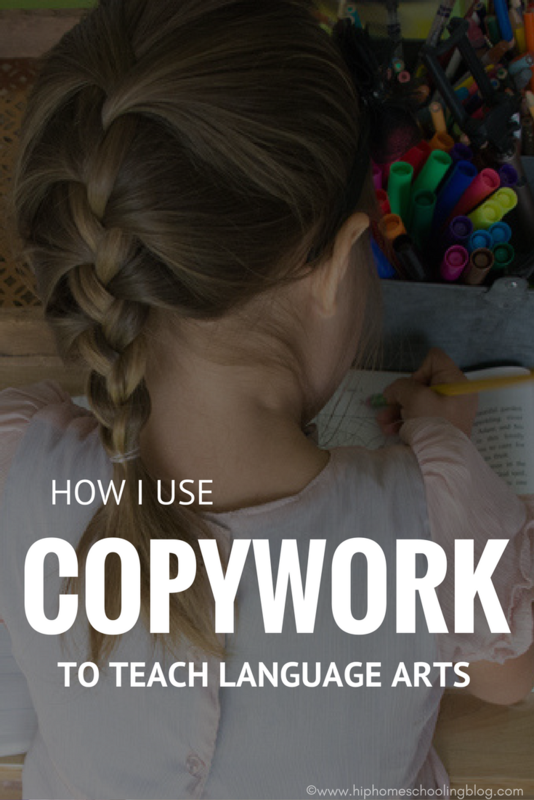 Have you used copywork in your homeschool? What does it look like for you? Disclosure: This is a sponsored post. I work with Brave Writer to share my experiences and get paid a small commission if you purchase through one of my links. Thank you for supporting my blog! Filed Under: Language Arts, Reviews Tagged With: brave writer, bravewriter, copywork, language arts. Because of all your wonderful reviews I decided to give Brave Writer a try. We are just slowly easing into it with Poetry tea time. You are very inspiring and motivational. I will be homeschooling my son for the first time those year. He is going into the 6th grade and is almost 12. Writing and language arts are PAINFUL for him and his biggest struggle. He doesn’t like it, isn’t good at it, and doesn’t want to do it. I am nervous about being his teacher as I am not a teacher and can use all of the help and advice I can get. Hi Shannon. My son is 11 and we are starting 6th this year. From the sound of it, our sons are extremely similar in their attitudes toward writing. Just curious if you used Brave Writer last year and what you thought? I think we are going to try it. Thank you! Ok, so with my first year of homeschooling mostly under my belt I feel my goal of doing copywork has not materialized at all. In many ways it has backfired! My 7yr old has a learning profile of NVLD – basically an auditory learner with some very significant challenges in visual spatial, visual perception and visual motor integration. Copying anything is painful for her. Her hand hurts, her eyes get lost. Now I haven’t modelled copywork and your post is a good reminder to me- to mentor, model and lead by example. So I will start there. Does it count for copywork if it is tracing work? If I take a passage that she selects type it and print it using a primary lined font in a faint color and she copy’s over the lettering with beautiful pencil work or lovely colourful markers does it count? What if she types it? Orally she knows SO much more than she can produce written. Recommendations from formal professional testing was to use scribe/note taker, use speech to text, teach typing, AND work on pencil skills at home and with Occupational Therapist! I am loosing my mind– I can’t do it all. All kids are special but I feel my child without extra challenges gets no help and my child with extra needs doesn’t get enough. I am not after her “doing lines” like at the old fashioned school especially not filled with mistakes. I am sold on copywork as a framework but not sure how to implement it in my situation. Hi. I am a mom of 3 kids, almost 7, 5 and 3. My husband is a police officer and we are finding our son really missed him on the weekends if he is working so we have decided to try homeschooling. I will have the 7 and 3 year old home full days and then my 5 year old daughter is in nature kindergarten Mon/Wed every second Friday. I’m nervous about all of this but love this idea of copywork. Any suggestions would be greatly appreciated. Thank you! I would love to know where you got the wooden book holder? It looks like just what I need! I couldn’t agree with you more about the efficacy of copywork. 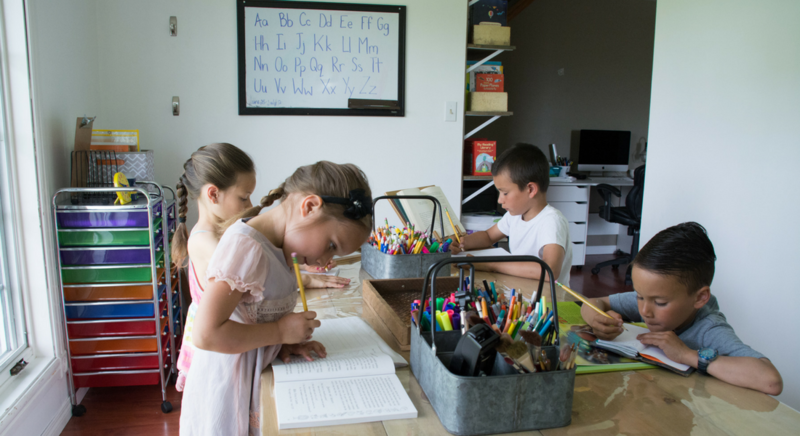 My kids are 23, 19, 14 and 13, and we began homeschooling when my oldest was 9. My oldest was an English major in college and is now a teacher; my second is a biology major who won his college’s original-fiction contest this year (so, not a science guy who can’t write). Alongside excellent reading, this simple exercise really does help kids to internalize how good written English is supposed to sound. Its official purpose is to teach handwriting, but it does so much more than that, I’m convinced. We have done very, very little formal language-arts anything, ever, yet my kids are all good writers. *Less is more, especially in the beginning. It should NOT feel like punishment. Start tiny. The amount you give should be no more than the child can do with his best effort, ie before fatigue sets in. If that’s one word of a stanza of a poem, that’s fine. Over and done. Five minutes, max. Gradually add more as the work becomes easier. Encourage illustration! Even if a child resists, you’re not asking that child to do some huge arduous task. They can write the one or two words, and then life can go on. Knowing this helped me to be firm about what I was expecting them to do — it really wasn’t torture, and once they got into the groove, nobody complained, even my most fine-motor-skills-challenged kids. *The examples should all be good prose (or poetry). 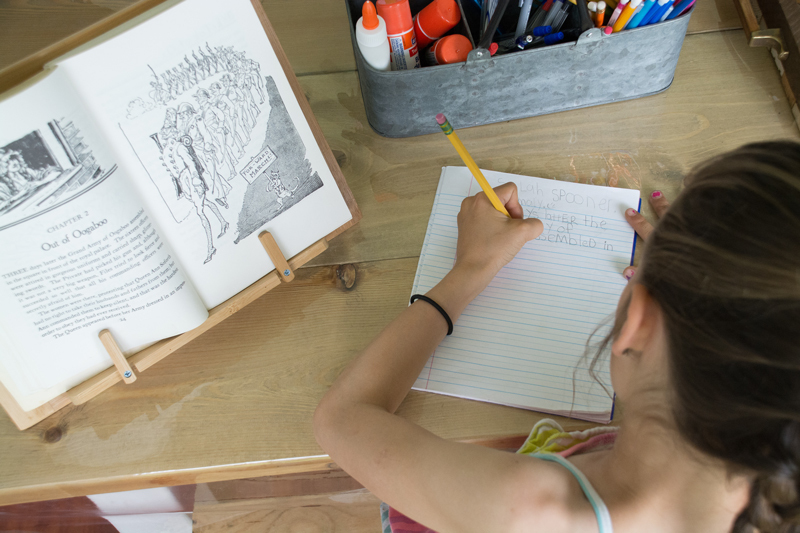 If copywork is going to teach good writing, it’s better not to use the child’s own writing for this purpose — that limits the child to his own current level of ability. I would have kids dictate letters to me, and they could copy (or trace) them to send, but for regular copywork, we stuck to the examples of established writers. *When my kids were younger, I used to start the day with copywork, because it was a natural way to get everyone sitting down and attending. I’d put on some nice classical music, and they’d write for 5-10 minutes, tops. I usually used the same passage for both my younger kids and just wrote it out in their notebooks. With beginners/first/second grade-ish, I would write on every other line, so the child could copy in between without having to look back and forth. As they matured and got better, I would write on the left-hand side of a double-page spread in a composition book, and they would write on the right. To Lynda, your daughter sounds very much like mine. If you haven’t already done so I highly recommend screening for Irlen Syndrome. It may be possible to correct some of the visual and spatial issues with tinted lenses carefully selected by an Irlen Diagnostician. It changed our lives for the better. Language arts is still a challenge, but now fewer tears and slowly growing confidence. I am keenly interested in using copywork to build confidence in the act of writing. Hi! Your post on Brave Writer is timely for me. I’m trying to understand how the program works and if it would be a good fit for us as a total newbie homeschool mom with a new Kindergartener? I love what I can understand about it but my concern is that it might be to freeform for the 2 of us (mom + kid) just starting out. (I can see how newbies are drawn to a traditional/workbook format, if only for the security!) Or perhaps, once you get through your beginning reading (100 Easy lessons for us right now) it makes more sense? It’s not cheap but I’m not against spending that much if I know what I’m getting and that it’s a good fit. Would love to hear your thoughts on this based on your experience with Bravewriter and your kiddos. Thanks for this post! My 6 year old is having a tough time with handwriting now- I love the idea of making this a group activity- it really captures the “warm and fuzzy” that i feel Brave Writer encourages! hello, love your blog, where did you get those metal bins on your table i just love them.